Alkaline batteries loose almost all their capacity at lower temperatures, and it’s pretty cold up there in the space. At 50,000 ft altitude, the temperature drops to -60ºF and Alkaline batteries would almost certainly freeze. HAB-1 got its power from Energizer Advanced Lithium batteries, which work in extremely low temperatures, plus have larger capacity. There were 10 batteries total: 8xAA for APRS and 2xAA for camera. Unfortunately, lithium batteries are about 10 times more expensive than Alkaline ones. 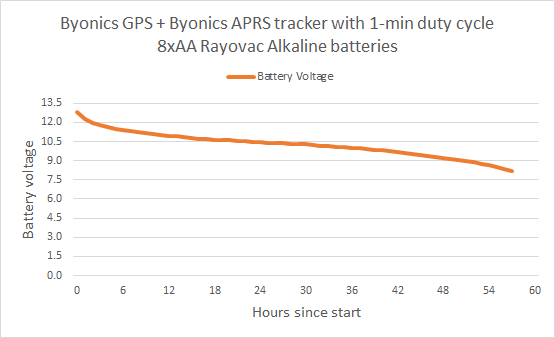 For testing purposes, I used Rayovac Alkaline batteries with 1,500mAh capacity. Lithium batteries carry 3,000mAh, so I assumed that electronics during the flight would last at least as long as during test, or up to twice longer. 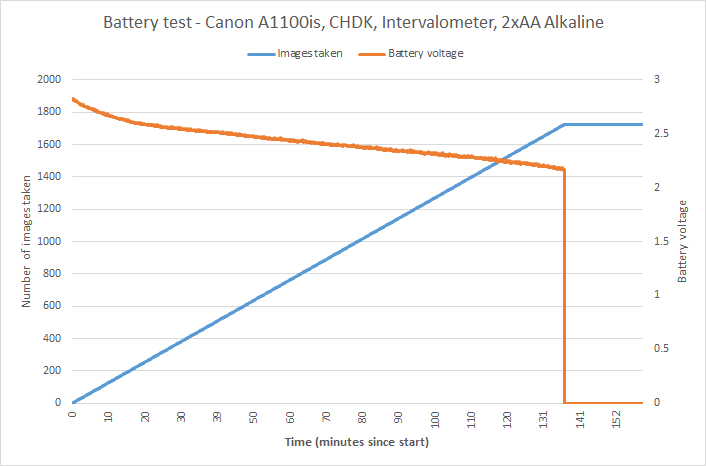 With 2xAA Alkaline batteries, and shooting an image every 5 seconds, my Canon camera lasted for 2.5 hours and took 1,700 photos. Impressive! With 2,000mAh LiPo battery, and 25% duty cycle (0.5s transmit / 1.5s idle), radio beacon kept going for 4 days. After this test, I reduced the duty cycle to 12% (0.5s transmit / 3.5s idle), at which it should keep working for a whole week. Wow! LiPo batteries do not work in cold temperatures. I taped a few hand warmers around the battery to maintain its temperature.